Poor soil fertility is a key constraint to improving farm productivity and farmer livelihoods in sub-Saharan Africa (SSA). After several decades of emphasis on biological approaches to soil fertility improvement, partly because fertilizer availability was itself a major constraint, there is now wide recognition of the need to increased fertilizer use to achieve sustainable increase in crop productivity in Africa. 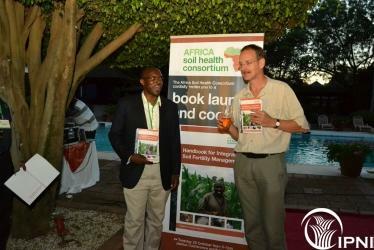 Various technologies have been developed to improve soil health and their work is documented in scientific literature. However, very little work has been done to synthesize and disseminate this knowledge in formats suitable for use by the different actors involved in farming systems development. As part of a four year (2011-2014) initiative the Africa Soil Health Consortium (ASHC) initiative funded by the led by CABI Africa, IPNI are working with various institutions to develop knowledge products to improve knowledge on ISFM at all levels of society. The project is focusing on synthesizing up-to-date information on ISFM and apply it to produce materials in a range of formats targeted at different stakeholders including policy makers, private sector actors, extension workers, farmers and university students. Synthesis of new knowledge on ISFM into formats that are meaningful to various stakeholders. Develop site specific cropping system extension materials in partnership with organizations at local level. Monitor fertilizer use efficiency at different scales and over time to assess the effectiveness of improvements in integrated soil fertility management on resource use efficiency. The project is delivering high impact in the short term by providing customized knowledge products to improve productivity in a range of farming and cropping systems in SSA. Dr Zingore is the vice-chair for the Technical Assistance Group of the ASHC.